What, exactly, is so interesting to the scientific community about the find? According to the “establishment,” this interesting mammal lived in China 164 million years ago, about 100 million years before most evolutionary scientists believed mammals filled such niches as swimming, or grew bigger than a shrew. Schmid wrote: “The discovery of a furry, beaverlike animal that lived at the same time of dinosaurs overturned more than a century of scientific thinking about Jurassic mammals. The find shows that the ecological role of mammals in the time of dinosaurs was far greater than previously thought.” Wilford added: “In the conventional view, the earliest mammals were small, primitive shrewlike creatures that did not begin to explore the world’s varied environments until the dinosaurs died out 65 million years ago.” He went on in the article to explain that the find totally upsets this conventional view. Let’s analyze what is happening here. For the last “century,” science textbooks have been teaching us and our children that the mammals that lived with dinosaurs were small, about the size of a shrew. This “conventional” teaching held by the majority of the scientific establishment was impressed upon our minds in a host of memorable ways. We were treated to stories in which the characters would travel back in time to the age of the dinosaurs with no references to mammals. We have viewed museum exhibits that portray dinosaurs everywhere, with no sign of mammals. We have been shown textbook illustrations depicting dinosaurs that conspicuously leave out all mammals. 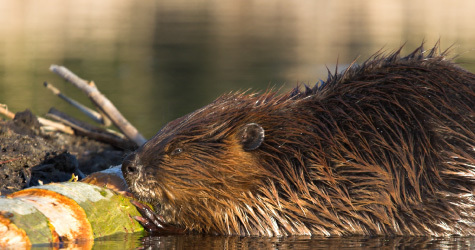 Yet, one little beaver-like creature overturns all that evolutionary scientists previously thought about mammals and dinosaurs. The aggravating thing about this situation is that in the articles that reported the find, there was no accountability for the wrong information that had been disseminated for the past century. How is it that the majority of the most brilliant scientists in the world have been off by 100 million years? And how is it that the information about shrew-like mammals, which has been taught as virtual fact in every outlet available, gets jettisoned by a single find, yet no one questions the way that such erroneous information could get passed on for so long? It is time that critical thinkers take a long, hard look at the “conventional” beliefs of the scientific establishment. One hundred million years is a huge amount of time to brush aside with a wave of the hand. The truth is, not only are evolutionary ideas about when mammals lived wrong, but the entire system is based on unproven assumptions, inaccurate calculations, and ridiculously exaggerated periods of millions of years (which can be modified by the hundreds of millions on a whim). What new find will surface tomorrow that eradicates another 100 million years of assumed time and a century of conventional thinking? 1 Randolph E. Schmid (2006), “New Fossil Overturns Notions of Mammals,” Albuquerque Tribune, http://www.abqtrib.com/albq/nw_science/article/0,2668,ALBQ_21236_4500071,00.html. 2 John Noble Wilford (2006), “Busy Beaver Swam with Dinosaurs,” Sydney Morning Herald, http://smh.com.au/news/world/busy-beaver-swam-with-dinosaurs/2006/02/24/ 1140670261970.html.